"What a wonderful treat: A girls' weekend, Yoga Jam, and the Cougar cabin! The cabin was the perfect place to start and end our days. Thank you for the hospitality. We'll be back!" "We loved FloydFest but enjoyed staying here more! Great, relaxing and comfortable. Hope to be back in cooler weather!" "Thank you for a peaceful and restful week in this beautiful place." "We certainly enjoyed our visit to Willis and your comfortable "cabin in the woods". We checked out Claytor State Park and Radford, anda ctivities in Floyd. I'll have to come back and learn how to dance flat footin'. Thanks again. I'll miss the cardinal wake-up call. A beautiful cardinal tapped our window every morning. What a treat to wake up like that." "we had a fabulous time celebrating a bachelorette weekend before the big day next month. Thank you for this amazing cabin and experience; we loved every second of it." "Our family enjoyed a lovely "unplugged" weekend away from our VA Beach homes. We explored and challenged ourselves on the well-kept trails. We relaxed on the serene porch in rocking chairs. We roasted marshmallows and relished in each others complany around the fire pit. The cabin was perfect, we cannot stop singing it's praises. It is evident that you want your guests to have as confortable a stay as possible and your attention to detail is very much appreciated. Thank you for this cozy hide-away, we plan to come back in the fall!" "A lovely stay once again at Indian Creek Cabins - our tirst time in early spring prior to leafout - enjoyed the views long distance and close up of the streams and rhododendrons and sky. Thank you for the comfortable lodgings - especially enjoyed the cast iron skillets and liquid soap in the kitchen - and other amenities - and light-filled space of the great room." "Another wonderful stay! This is our 3rd time staying at your cabins and we enjoyed it just as much this time as we did our first time 11 years ago." "What a beautiful cozy cabin we have been welcomed into! My husband and I traveled all the way from sunny south Florida for a romantic honeymoon in the mountains. Much to our surprise a snowstorm hit just as we got in. We're so amazed by the wonderful hospitality given to us by this beautiful couple. We plan to use this time to relax, drink wine, and celebrate our new life together. May God bless you guys!" "This place is beautiful. The stars last night were phenomenal. I love the cabin. It is warm and cozy and we added Argentine Tango music. I would love to come back again." "Such an amazing and beautiful place in the fall! We will definitely be back! Cozy and quiet...perfect!" "JUST PERFECT!! We are here celebrating our 9th wedding anniversary with our 3rd stay at your beautiful cabins. The boys are 4 and 7 now and we loved watching them explore the trails with our dog, Milli. This year we stopped to pick a bushel of apples at Windy Hill Orchards in Ararat, VA and we spent Saturday at the Sinkland Farms pumpkin festival. So much fun! I can't thing of a better way to celebrate Fall and our family. Thanks again for making this possible." "First two mights of our honeymoon. Raqined but we still had an awesome time. Awesome cabin and great time and Chateau Morrisette Winery!!" "Enjoyed our stay here. Came for a family reunion. Loved the view, and loft, and just loved the whole place. One day I will return. Was here with my daughters." 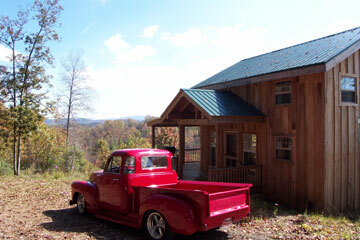 "We had a short but sweet stay at Cougar cabin on our way to NC. Enjoyed the peace and quiet. The sunrise from the loft was AMAZING - a true spectacle of beauty!! Wish we had more time to spend to ezplore more - quite an area for riding!" "Had a wonderful five day stay at the Cougar Cabin. Came here to emjoy the country air and get away from it all. I needed time to get caught up on some work stuff as well. So it was a great place to have a work/vacation get away time. Will highly recommend this place and will be coming back." "We love our stays at these cabins! This is our 4th time at one of the Indian Creek cabins. We've stayed at both and each have their perks! At this one (Cougar )I love seeing the sunrise from the loft - there's nothing like waking up to colors of pinks and oranges all around you! We attempted to do a puzzle this visit - phew - they are tricky ones. Good luck to the next person! Once again an incredible time at our favorite get-away." "We had a very relaxing time in the cabin. It was nice to get away from the "rat race" for a couple of days. It is amazing to step outside and not hear anything but stillness. Thank you and God bless." "What a beautiful place! It was absolutely perfect - we just wish we could have stayed longer! This was our first vacation with the dogs included - they loved it! Thanks so much for a wonderful get-away! Hope to see you again in 2015!" "Enjoyed this place even in the rain - one really great sunrise. The countryside is really beautiful as well. I hope to return someday as our ancestors were from here. We found where they lived and worked in Indian Valley." 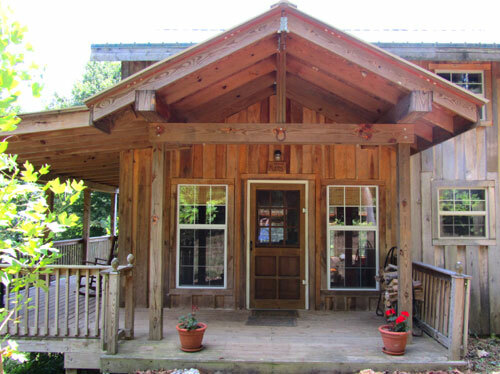 "We had another lovely visit at your beautiful cabin and enjoyed the Yoga Jam as always. See you next year!" "Thank you for this beautiful cabin for our Floyd Fest Weekend. we loved it!" "We had a great time in the cabin! We hope to come back in the fall. We think it would be nice to see the turn of the leaves in this beautiful cabin, and we would like to spend time in the cabin. "Go Hokies!! We enjoyed our stay with friends and family during VT's Graduation Ceremonies. Plenty of room for all!! Hello, I loved my stay here and I heard some weird noises in the woods! I thought it was an owl but it peered out of the bushes at night. Watch out. I loved the stay, it was amazing. So good luck and stay alive. Oh I forgot you can look at that cougar painting, it's quite enjoying. Now it is good luck and stay alive. PS I'm hearing something...I got to go...oh no...aaaaaghhh! cougar attack, run.. save yourself." "Brought my fiance for his birthday present. This is our first time here and we've been entranced by the stillness and peaceful beauty. How refreshing to get away from the busyness of life, work, children, and wedding planning. We both feel like this night away allowed us to reset our perspectives and priorities. To be still and remember that our creator has everything under control - we don't have to. So thankful to the owners for allowing and creating this opportunity for us." "We came with anticipation of a fun weekend. And what a fun weekend we had. We love these cabins; we have stayed at both - both are cosy. Nothing like hiking on the property trails and coming back to the cabin and building a fire inside or outside. Relaxation is what it's all about. Love the peaceful sunrise in the morning and the view, created by God, that comes along with it. Long live the peacful cabins that have served so many through the years. Everyone desires and needs a place of serenity and solitude - we found ours here at Indian Creek, again. Looking forward to the next sunrise." "What a lovely place you have here! We had a wonderful stay and look forward to returning soon." "We had a very nice visit to your great cabin. Love all the wood! Great walks on the trails. Total quiet. Thanks for a great stay." "Thanks for a great weekend - enjoyed the nice cabin - very quiet." "Thank you so much for such a lovely place to stay. The proximity to the Yoga Jam was perfect. We enjoyed the amenities very much and hope to be back next year." "We enjoyed staying at Cougar Cabin, the mountains were great. The fresh air and quietness were the best. Hope to see you again." "When we left Mississippi to begin our move to VA, we were a little overwhelmed at a transition without our 'stuff' and 5 small children. We never would have thought this month long visit to your cabin would have been a get- away vacation for our family! What an amazing surprise and blessing! We truly felt at home with all of the conveniences here in the cabin. You really thought of everything. Our children felt like they were staying at "Ma and Pa Kettles" cabin. They love that show. I must say this place is much nicer though. We will recommend your cabins to my family and friends. What a perfect spot to get away from the busy, hectic world and truly get back to the basics of spending time enjoying each other's company. Best wishes! Looking forward to our next vacation! Thank you for sharing this special memory with us!" "Three sisters: We came and stayed for three mights while visiting FloydFest. We loved the cabin - very peaceful and a nice get-away from the wired world - although we did get online briefly to watch the weather, which turned FloydFest into' MudFest'. We hiked the trails - no bobcats, but plenty of deer tracks. Thank you for making this beautiful cabin available!" "This is a 60th birthday present from my husband, and it's been wonderful! We've enjoyed the sunrise and a bright moon from the loft. An all-day rain was perfect for relaxing and reading. Fireflies, a great horned owl, a red fox, lots of birds, hearing the creek at the bottom of the valley - all added to the restful ambiance. Today I helped myself to a bunch of grapevines (watching out for poison ivy, of course) and spent a pleasant morning making grapevine wreaths. We've also enjoyed biking along the Chestnut Creek out of Galax, not to mention the many venues for bluegrass music and dancing. We bought a hand-carved hardwood limber-jack (Is it a puppet, or an instrument?) from Phil Kirk in Hillsville. Steve Barr in Barr's Fiddle Shop is a gem, as are his instruments. Finally, I can't say enough about this beautiful cabin and all it's comfortable details. Thank you for making it available!" "The proximity to Floyd and Villa Appalachia was ideal. My husband and I love the relaxing atmosphere. It was a great weekend; we look forward to further visits - maybe a fall get-away with a little fall foliage. A wonderful weekend! As to poison ivy...we'll see... hopefully not. Look forward to future visits. Best pet friendly around." "We had a wonderful weekend at Cougar Ridge Cabin. The weather was so perfect. The kids loved playing in a big field of tall grass, flying kites and blowing bubbles. Roasting marshmallows and a couple of fireworks were a big hit. It was wonderful to get away as a family." "Thanks for another lovely weekend. All was perfect!" "Absolutely a beautiful stay at Cougar Ridge! With so much happening (Boston Marathon Bombings) it was nice to take a step away from the chaos. Exceptional views from bed watching the sunrise over the ridge. Pure tranquility! Thanks for the hospitality!" "So nice to snuggle in the cabin with the snowy woods outside. We love it up here in Floyd!!" "We had a lovely stay here at Cougar Ridge! The wood fire was amazing. We listened to music, made a steak-and-potatoes dinner, sipped on whiskey, and played some tunes together as loud as we possibly could (he on accordion, my on guitar). So great to have respite in this beautiful place!" "Another wonderful New Year's Eve in Cougar Ridge. Thanks so much for your continued hospitality. It's always just what we need." "Cozy cabin, snow-covered ground, beautiful sunrise over the mountains, quiet serenity...the perfect escape after a bustling work week. Thank you." "The peace and beauty of this place is just what we needed." "Absolutely loved our stay! Most relaxing vacation ever! The cabin is beautiful and so are the surroundings - the perfect mix of modern comforts and serenity! Thanks so much!" "Thank you again for a wonderful stay - our third year in a row! This our first stay in the Cougar Ridge Cottage, and it is just as nice as the Bobcat. It is always a nice treat to relax with family here, and these cottages are wonderful!" "A week in the Blue Ridge couldn't have been more lovely for two old college buds and two frisky Portuguese Water dogs. You have spared no effort in making the Cougar luxurious where it counts (cloud-like beds and huggy warm towels, and endless hot water). At the same time you've captured the essence of cabin life - rockers (comfortable!! ), great wood stove, and professional grill which we used for every meal! Just a perfect place to reconnect and the dogs couldn't have been more content. Thank you." "We had a wonderful time relaxing and visiting the local attractions! The cabin was beautiful and we slept well on the comfortable beds. Thank you for all the great details!" "We're baaaaaack! I really like coming here with 'the girls' and my wife. This may be 'the girls' last trip as they're very old and rarely show interest with more than a nose wiggle or raised ear. They do like sleeping here which is a job they accomplish with their old dog vigor. When I was a child we went to my grandaddy's camp in Deerfield, VA. We hand-pumped our water and electricity was the few strung lights that led to the outhouse. When we tired, we would nap under the trees. As a teenager, I worked for Waynesboro Streets Dept. spreading asphalt, working on the trash truck, and clearing brush. When we got tired we'd find a tree to sit under and eat lunch. Years later I worked building run-off barrels and concrete dissipaters for I-64. After carrying and tying rebar, we would break and lunch under the shade at the forest edge. I never really thought about the trees, it just seemed that they were there, always...Not because of what I did, but...just because. This is such a place...just because...just in the trees...a place to rest." "What an attractive cabin! It is very tastefully decorated - lots of nice touches. We had such a short stay so not a lot of time to take advantage of so much to see here. We hope to come back in the fall when it is cooler. We particularly enjoyed the porch and the quiet, away from telephones and TV. The gas grill is a nice thing to have. Many thanks for the lovely blackberry preserves. Thanks for giving us some eggs. We would have had a strange breakfast with bacon and toast. "Thank you so much for the good care and love you put into this cabin. It was such a wonderful retreat from the city - so beautiful and quiet and nurturing in every way." "What a happy accident that I found the website for these cabins! I was looking for a place for us to spend our 33rd anniversary and this looked perfect. Thank you for such a wonderful place. The peaceful solitude is refreshing! The cabin is wonderful and so comfortable. Much attention to details! I was disappointed that the cloud cover prevented us from being able to see the 'super moon' that was out Sat. night!" "What a wonderful place to walk the loop, catch up on reading, play cards and just relax! We appreciate all you've done to make your cabins charming and comfortable." "This has been a great stay for a Valentine's Day present from my boyfriend. We both love the cabin and the view. We'd love to have a beautiful cabin like this some day. It was great just to get away from everything and just relax. Thanks for the preserves also! Thanks again for everything! Hope to see ya soon." "Such a beautiful place we stumbled upon when coming to Floyd to see 'Ketch and Critter' at the Floyd Country Store! Love all the thought that went into building the cabin with all its wonderful views! Cannot wait to return again and to tell all our friends and family!" "Rendezvous with family over Thanksgiving was wonderful. Weather, view, night sky and woodstove all were major points of enjoyment. Lovely sunsets and sunrise viewed from under the covers, what could be better! Thank you for the care you have taken to make this such a great experience for us!" "A girl's weekend to celebrate our birthdays (50th). what an awesome place to do so. We can't say enough about the interior furnishings, from the most comfortable beds to the nice and fluffy towels. We spent a lot of time on the porch rocking, talking, laughing and enjoying the beautiful view. We will be back. Thanks for an awesome place! The 3 Musketeers." "This is a beautiful place - both inside and outside. On top of the mountains this morning there was heavy ice on all the trees. From a distance it looked like snow, but as we got closer we realized it was ice. Every branch of every tree and every leaf of every plant was covered with ice. And as the sun came out everything glistened and looked like a surreal fairyland." "What a wonderful romantic, restful weekend. Gorgeous cabin and gorgeous weather. Hiked trails a bit. Enjoyed the porch and views --could sit there in the AM even at 33 degree temperature. Loved the wood stove. We'll be back." "What a wonderful way to celebrate the 18th anniversary of my 30th birthday! For the first time in quite a while we are relaxed and stayed void of computers, tv, and work. Cougar Cabin is an amazing retreat. As others before us have written, watching the sun rise over the mountains while lying in bed was a delightful way to start each day. Last night the full moon illuminated the stained glass in the peak - almost as bright as the sun but in a different magical way. This morning as we finished breakfast preparations we noted how nice it is to have a place where we share only happy memories. How true! I smile as I write this. Such a beautiful place, such a wonderful weekend, such wonderful memories!" "What a wonderful place to celebrate our 1st wedding anniversary! We spent two nights of our week-long Blue Ridge Road Trip here at Cougar Ridge, and we cannot wait to return! Despite the rain we enjoyed the beautiful scenery and explored many miles of mountain roads..truly breathtaking. So glad we found your websire...though the pictures do not do this cabin justice. Thanks so much!" "Our dogs loved the trails and for old girls did a lot of running up hill!! !...and a lot of sleeping afterwards. Sunrise was always a 'wake up and see this' event. Watched a spider on her web and did little else...but we like to do 'little else'." "We had a wonderful time this weekend. We enjoyed the hiking trails, fire pit, nature, and relaxing cabins. We leave today with wonderful memories. As our family is growing and connecting with one another, this place gave us a great place for bonding and lots of laughts. Your cabin is beautiful and hopefully we will return again." "Thank you so much for such a wonderful vacation for our family! The view was beautriful. This was the perfect getaway from Hurricane Irene. We will definitely be back in the near future!" "Enjoyed another wonderful weekend at Indian Creek. Love the hammock location. Well worth the walk. See you again soon." "Had a wonderful evening sitting on the porch rocking and listening to nature. The cabin is absolutely beautiful. Look forward to visiting again. Thank you." "We had a fantastic time exploring the area. What a geautiful cabin you have here. We spent our two days here hiking on the Blue Ridge Parkway. The Rock Castle Gorge trail is worth the exercise. We did the entire loop. 10 - 11 miles and came back to the cabin exhausted. The grill is great! We hope to be back again." "Had a wonderful romantic weekend getaway. Enjoyed the trails and visiting Chateau Morisette. Thak you for sharing your beautiful cabin with us. Hope to be back!" "This was a fun time here. I will definitly come again! I hope you have a great life and that you get more customers. I will tell all my friends about this place. I love the upstairs room! I think that you should put a tv in the rooms." "Wow!! Great food, great family and great accomodations. Came with 4 generations for the graduation from med school. Thanks for helping to make it all happen." "Grandson graduated from VT. Had he and my sons here in 2 cabins to enjoy family time together. Facilities were great - Distance not so farfrom VT. Because of rain, didn't get to enjoy outside too much. Thank you for all your help." "We will always remember our time in this cabin as the moment we fully decided to move to Floyd. The peace, beauty and friendliness of the people just cannot be beat! My husband greatly enjoyed cycling the roads near Indian Valley and we both loved the hammock by the spring/stream. Since most who read this journal already know the magic of this place, I'll make sure to send you an email to share on your website. Huge thank you and congrats for creating a space that has everything one could desire - wonderful bed, fluffy towels and a magical porch. Thanks again!" "As Robert Frost said so eloquently,'Two roads diverged in a path and I took the one less traveled and that has made all the difference.' For your hospitality and the tranquility and beauty of this special place I am truly grateful. We'll be back again soon." "This is a wonderful Valentine's Day get-away with my boyfriend. It feels like we are in our own little world, with such wonderful views and serenity. We both love the cabin, and we hope to have a little cabin like this one day. We love the fireplace and drinking tea sitting in the rocking chairs on the porch. And later we will make s'mores in the firepit outside. We wish we could stay longer to enjoy quiet time. We will definitely come back here many more times." "This cabin has been the best setting for a wonderful romantic get-away. My boyfriend and I have been together for four years which is why we are here to celebrate. But thanks to the romance of this cabin we are leaving as an engaged couple. He proposed to me on the beautiful deck. This place will always hold a special place in our hearts. And I'm so sure we will be returning throughout our lives together. Thanks so much for sharing this cabin with us. Thanks." "It was a delightful place to come. So comfortable too, did enjoy the nice bed. We had ground coffee, will probably be like our campfire coffee. Thanks for your sons and whoever planned and built it. It is a perfect place for peace and quiet. We had a nice comfortable bed just 1 step up to it, and then two went upstairs to a nice bed too. Thanks for your hospitality." "The day has come for us to leave...but we are taking some of the quietness and solitude home with us! Thanks to my bride of twelve years for this awesome week of rest - no TV- no phones - no noise but the wind in the trees and the animals at nights. It's been too long since we just sat and read or listened to the radio together. The Cougar offered us the opportunity for all of the above. How beautiful the surroundings prepared by our Father, to whom we give all glory and honor." "Had a wonderful time. Enjoyed the firepit with my family and the closeness the cabin brought to our family. This was my mother's home town. She was a McPeake, so being here was made extra special since she is no longer with us. But being here it was just line she was. Thank you so much for having us. PS the sun rise was beautiful." "Your cabin is so inviting and comfortable, from the sofa and chairs to the deliciously soft bed to the soft towels...we felt truly pampered. Thank you for all of the thought you put into taking care of your guests. We greatly appreciated the homemade, local, fabulous blackberry jam, and were so happy to have gotten fresh-made english muffins at the Charlottesville Farmers Market on the drive west, perfect! We were mildly disappointed to have not been able to have a evening fire in the woodstove, but the daily 80 temps kept the cabin plenty warm! Thank you! - P.s. your bathroom tile work is beautiful! Millstone coffee and tempur-pedic bed. Thanks so much the the best!" "We decided to take a restful weekend for my birthday and our 50th wedding anniversary. This place is really nice and cozy. The beds are good and firm. I enjoyed the view and morning sunrise from the loft. Unfortunately my husband was not able to climb the stairs so he missed our on the great views. We also brought some DVD's up, but didn't find the DVD player. After 50 years we have learned to accept the things we cannot change and let the Lord do the rest." "We had a wonderful stay. What a retreat! Beautiful, peaceful, and stress free. - Thanks for providing such a great experience." "The cabin is great. You have it fixed sooo nice and comfortable. We loved it and had a great time here. Thanks a lot for everything!" "What a nice place. My wife and I throughly enjoyed our three night stay. We had been 'stressed out' before we came but now we are relieved of that. Hope to be up here several more time during the years." "We had such a wonderful time! Your cabin is the perfect retreat to rest, recharge and most importantly, to spend quality time with family. We moved from Indian Valley four years ago and Cougar Ridge was the perfect spot to revisit/relive our old stomping grounds - nature even provided a beautiful thunderstorm show that we enjoyed on the porch. Many thanks for your hospitality and the blackberry preserves! This cabin is truly a gem!" "This was a wonderful place to celebrate our daughter's graduation from VaTech! We hope to visit again!" "We had a great time and loved all the wind blowing the entire time. The jam was awesome." "Our 1st time to visit - but hopefully not our last! Celebrated an early 26th anniversary. Hiked the trails and slept in the hammock! Great quiet relaxing weekend. Even the rain was nice on the tin roof. Excellent attention to detail at Cougar Ridge Cottage. Very tastefully decorated. Rarely will you find Tempur-pedic mattresses in rental units (I know how expensive they are!) Very well done - next time we want to try Bobcat Bungalow." "What a beautiful cabin - nice comfortable furnishings, comfortable bed, luxuriously soft towels! And the views were amazing. We enjoyed a weekend getaway while the kids stayed home with their grandparents. We hiked a few of the trails through some mud, ice, and snow and enjoyed exploring. Great view from Blackberry Hill! We truly enjoyed your little piece of secluded heaven and hope to return many times in the future! "Your cabin was the perfect place to meet up with good friends and spend a relaxing long weekend. The cabin is beautiful, the views are breathtaking and the beds are amazingly comfortable - a perfect recipe for contentment." "For the past 4 years we have come to your cabins for our anniversary. (This year we celebrated our 16th together.) each time we come, we are in awe of your cozy little place out in the woods where beauty surrounds in every direction. We leave here well rested, rejuvenated and refreshed - vowing to return again." "I came to Cougar cabin w/ my friend and her family. It was such an amazing adventure. The snow was the best! We made snow forts and went tubing down and mountain. 'Toonces the Cat' was such a strange and funny movie. I recommend it to all. Thanks for the snow and the nice vacation." "I came with my family to the Cougar cabin. It was sooo fun. We made ice forts, snowmen, and had snowball fights. We even went down a giant hill with the tube.! My favorite video of yours was 'Toonces the Cat'. Thanks for giving us a great time.!" "We wanted a 'white Christmas' and we found it here. The views are so beautiful and the air so crisp and clean! Thank you so much for the wonderful Christmas vacation! We'll be back when it's warmer to pick some blackberries. Thanks for the jam!" " Enjoyed the cabin, the furnishings were lovely, the serenity priceless. The weather was cold and damp, but the stove kept us perfectly warm and cozy. Macados and The River Company - good restaurants in Radford. You can catch a movie in Christiansburg, fly fishing and a beautiful hike (easy) can be done in Rock Castle Gorge. Good blue grass in Floyd on Friday nites, the entertainment from the people who get up and cance, priceless! Our dogs loved this place!" "Within the first 15 min. on the porch all of our cares melted away. I now know what it feels like to 'Be still and know that I am God.' This truly is a slice of heaven. Thanks so much for sharing! We feel renewed and refreshed." "What a great anniversary spot... thank you so very much for making the weekend such a special one for us both. All the extra touches were just perfect and the cabin was just as amazing as we remembered. We also stumbled upon The Floyd Harvest Festival over in Floyd, VA which was a nice way to spend an afternoon...as were the trails and hammock with the leaves beginning to turn. This cabin and 2 days away from it all were the perfect way to celebrate our marriage... romantic fires, afternoon naps, and simple unencumbered togetherness." "Your cabin has been a beautiful spot to celebrate our 5th wedding anniversary. We are thankful that we discovered this secluded little gem in the Va mountains. Thank you for the special touches- the jam, soap, and all the little extras that provided a wonderful stay. We recommend The River Company Restaurant & Brewery in Radford. (633-3940) Off the beaten path. Great food! Looking forward to visiting again!" "Thanks for all. Had a most relaxing stay. When the kids saw the cabin, their thoughts turned to the holidays. So we listened to Christmas music. We even left "Cougar" a little gift in the CD player. We'll be back!" "We enjoyed waking to the sun and mountains every morning, reading on the porch and then picking blackberries for breakfast. That was on the the mornings that we weren't heading into FloydFest!" "Like everyone else who has written comments, we had a wonderful time. The cabin, the trails and the community were great, and your attention to details was like icing on a cake; lush towels, high quality sheets, great beds, the rocking chairs on the porch, even the blackberry preserves. (I even had my share of fresh blackberries as we walked your trails!). We hope to be back very soon." "We had a great time! Very nice cabin! Our dog enjoyed herself too! It was nice to come back to Va for our family reunion." "Spectacular eight days! The weather was perfect (it only rained at night and the rain on the roof is like a lullaby.) The cabin was comfortable and cozy. We spent the 4th at the Floyd Fandango - and listened to great music and ate good food. We did lots of exploring - Perfect retreat - We'll be back." "2nd time here/came with my brother from CA. Daughter visited and husband likes the views. Rose was a happy dog. Will be back with more family and friends. Fun to see cabin in January and June - great in winter with fireplace and open windows in June. Very clean, clean, clean. Will be back. :-)"
"This was such a beautiful, relaxing place to gather with our family. A spot of quiet and tranquility in the middle of all the hubbub of 3 graduations." "No cell phone reception, no bad news on the television, no loud city noise...just what the doctor ordered! Many thanks to our hosts who have created a place in the woods where one can collect ones thoughts and recharge the old batteries. After accidently locating Indian Creek Cabins on the net we have found a truly special place that will remind us of our daughter's graduation from VT with fond memories. Your perfect mountain setting will always be a part of that special day." "What a great place... We enjoyed ourselves very much. Very relaxing. We'll be back again!" "We had an awesome weekend in your cabin! The cabin is beautiful and the views are breathtaking! We brought our two shih tzus with us and they enjoyed themselves just as much as we did! Thanks so much for sharing your cabin with us! We plan on coming back for our one year wedding anniversary! "Best time!! This was by far the most clean place I have stayed. Will be back!!! Will have friends come!! "During the last three years that we've been coming here we've gotten married and had a son. We brought him with us this year and made more wonderful memories in your cabin. We hope to continue this NYE tradition for years to come! Cheers to 2009!!" "We are back at the Cougar Ridge Cabin after 5 years (Oct. 2003), but we have stayed at the Bobcat Cabin twice this past year. We really enjoy both of the cabins but the Cougar is our favorite. As always my husband and I enjoyed spending quality time together. We went to Floyd and shopped at Chic's Antiques and the Floyd Country Store. Would have liked to have shopped longer but was getting late, stores were closing. When we got back to the cabin my husband played his banjo for me. It really sounded great in the cabin. We didn't get to see the sun set or rise due to rain. But we really enjoyed sitting in front of the fire and listening to the rain on the tin roof last night. In the morning we were surprised to see ice on the trees. We really hate to leave here but we plan to return again one day, hopefully for a longer stay. Mary, thanks for the great blackberry preserves!" "Again we have come to a peaceful surrounding of beauty. The cottage is warm and inviting as always. The scenery is magnificent and we have found the rest and relaxation we were seeking. After staying here last year, we knew we had to come back and come back we did. You have created a wonderful getaway for us and we appreciate the opportunity to enjoy this. We hope to make this a yearly getaway. Thanks for the jam and we hope to come back next year to this beautiful place." "Our second stay at this wonderful place. Now our minds are clear, our hearts happy and we are full of smiles. Thanks Mary and John for a job well done." "We had a wonderful 30th anniversary weekend! What a beautiful place! The cake was a nice surprise also and was delicious. We'll definitely come back for the beautiful views and the quiet. Thanks for everything!" "Another wonderful weekend, just like before. We so enjoyed our stay and look forward to the next time. Thanks so much for everything." "What a perfect cabin for my wedding weekend. We had a girls' night the night before the wedding. Then we spent our first night as husband and wife here. We were very lucky to have this cabin right down the road from where we live. Thank you so much." "We had a nice, quiet, relaxing stay. Loved sitting on the porch rocking while drinking coffee and listening to the quiet. This is really a wonderful place!" "Thank you for making our anniversary weekend memorable! Waking up to the sunrise was indescribable. We loved the winery and taking the tour. My husband and I will definitely be back!" "Wonderful cabin get-away! Serene and romantic with great views of God's creation. Thanks for sharing your farm/land with the rest of us. A perfect place to recharge!" "As lovely as our first visit. In the words of our three year old, 'Boy did we have fun!' Thank you." "We had a great stay...so quiet! Thank you for your assistance the first day and your wonderfully supplied cabin. The blackberries are delicious! We hope to return again." "What a great pleasure it is to enjoy your beautiful cabin and your beautiful mountain farm... Thank you." "Great cabin, great weekend, great company, awesome view, and FANTASTIC blackberry jam. Thanks for the opportunity to reconnect with friends in such a calming setting." "What a great location for a fun girls' getaway weekend! Too bad it rained and we didn't get to go hiking, but we loved relaxing indoors too, listening to the rain. We wish we could stay longer!" The cabin was more beautiful than either of us had imagined. We loved the deck especially and ate all but one meal looking out at the trees and distant ridge, listening to the birds and the lowing of cattle. What a wonderful place for respite - just what both of us needed after 18 straight days of work! Thank you for delightful space and land." "This is the perfect place to get away from it all, not only is it secluded, it is extremely peaceful. The distant view of the mountains made our hearts smile. The accomodations were better than a 5 star hotel. Our only regret was that we could not stay longer." "Thank you for this lovely, restful place. We all felt so at home here - our nervous city dog found her "inner dog" and settled into this cozy life just fine. Our 2 year old loved the porch, the shower and the chicken timer most of all :-) My husband loved the trails - it seems a place we've always been - and hopefully we'll soon return." "It was so nice to be able to get away from everything. The lack of cell phones and television was so peaceful. It was nice to be able to relax w/out any distractions and I loved being able to sit in front of the fire. You guys have a beautiful place. I'm sure we will be back." "We had such a wonderful time in the peace and quiet of your cozy cabin. Your features are just perfect! We enjoyed watching the fire in the wood stove. We had a snow dusting in the evening, but during the night it cleared. At 4:30 am a peek outside was rewarded with a star filled sky! It was beautiful to see. Thanks and best wishesl"
"We definitely picked the right spot for our weekend getaway. The cabin is absolutely gorgeous and comfortable. The breathtaking views are postcard picture perfect. We were looking for a relaxing weekend where my parents and husband and I could get away from the hustle and bustle of our everyday lives. It was also the perfect place for my husband to recover from his auto accident earlier this week. We all have had a wonderful time and do not wish to leave. Thank you so much for the opportunity to experience this lovely place. We had a great time! P.S. My dad wants to know how much you want for the cabin? HaHa"
"From early morning sunrises to brisk walks through the woods tinged with autumn color...to crazy, winding trips through the beautiful countryside...to restful evenings before a warm relaxing fire inside a charming and comfy cabin...what more could two vacationing people ask for? Thank you for all of the above. We've had a wonderful time! "Fall leaves - fireplace - comfortable beds - out of the way - peaceful nights - night skies - outside fire pit - what else do you need? Enjoyed our 2 day stay. Will pass the word and will return." "We will carry many nice memories of the beautiful Blue Ridge Mountains home with us to the rolling hills of Pennsylvania. Thank you for your hospitality and for creating such a comfortable, relaxing, and peaceful place for visitors like us to enjoy." "This was our second annual friends reunion in the Floyd area. Another great time was had by all. In addition to catching up and remembering good times passed, we made new memories to recall at future gatherings. Here are some of the highlights from our relaxing weekend. Thank you for sharing your place with us!" "It is at places like this that you feel and hear God's presence. Thank you for being the conduit of that experience. We really needed to get away from the rushed lives that we live in the city. Thank you." "We didn't realize just how "citified" we had become until we arrived here! This has been wonderul for us to just get away from it all. Very needed! We did a lot of laughing at ourselves, exploring nature.. despite our fears of what could be out there, and learning to just relax. We enjoyed all of your books, games, rocking chairs, etc. If we had a bed at home as cozy as the one in your loft we would never get up. Thank you! "What a relaxing getaway spot! My only complaints are that we couldn't stay loner and we forgot our marshmallows! Thank for providing my friends, husband and me with a home for a night We will certainly be back to this beautiful area. "We feel really lucky to have found your beautiful cabin in the woods. We thoroughly enjoyed every minute of our stay and we definitely plan to come back in the future. Thank you for all your work that you and your boys did so others can enjoy this special place. "What a great family reunion. Thank you again for hosting and making us so comfortable. We love you!! "Lovely cabin. We were so happy to find such a scenic, quiet place for our stay. Being raised in this area it is nice to be reminded of Floyd's rural charm. Hope to stay much longer next time. We plan to stay here on every trip to Floyd from here on." "Wow! It's absolutely beautiful here! I told my husband yesterday I was not looking forward to leaving today. It's so peaceful and relaxing and our little 2 1/2 year old loves this "cool cabin" as he calls it. Thanks for the homemade preserves!! Yummy! We look forward to coming back someday." "What a wonderful place to do nothing but relax! Great time of year to watch spring's awakening. Even the snow in the mornings was breathtaking. So glad we are moving to the area soon. Thanks for the great jam!" "Thanks for the wonderful night's stay." "From the moment I spoke with Mary by phone to set up reservations I felt her warm, kind spirit. Then once we met both of you, the welcoming was most sincere and genuine. Once seeing the "Cougar" cabin all that warmth and kindness radiated throughout a place that was so inviting, comfortable and absolutely beautiful. To share a piece of God's creation with so many makes for two very special people. We are looking so forward to returning in a few months. PS The jelly was outstanding." "Thanks for a wonderful, relaxing time in your cozy cabin. Everything was perfect - especially being able to see the sunrise in almost every window. What a perfect, peaceful place. We will recommend it to everyone." "What a beautiful place! I believe this is the nicest cabin I have every seen. Mary and John - thank you for all the details you thought of to make us feel welcome and comfortable. I think you thought of everything! We loved the views, toasting marshmallows around the bonfire, cougar trail, and especially the loft. Our daughters felt like "Little House on the Prairie" getting to sleep up there :-). While staying here, we got to hike Buffalo Mountain. The views at the top were absolutely SPECTACULAR! Try to do this hike if at all possible. It took us about 2 hours to find the entrance, because there were almost no signs. I am leaving the directions here, so anyone else who would like to go there may find it more easily. We have enjoyed making many special memories here with our family, and will cherish them for many, many years to come! We are already planning to come back next year." PS The blackberry jam was fabulous, especially on our pancakes - Thanks! PPS The directions to Buffalo Mt..: Indian Valley Road to Willis at 221. Left on 221 and then right onto 799 (Connor Grove Rd., across from Willis Village Mart) right onto 727 (Moles Rd. ), follow up gravel road until it comes to a dirt road intersection at the top of the hill. Turn right and continue up this narrow road and go through gate on right to parking lot. Through the gate you will see little signs for the preserve. You can see Pilot Mt. in NC to the south from the view at the top!" 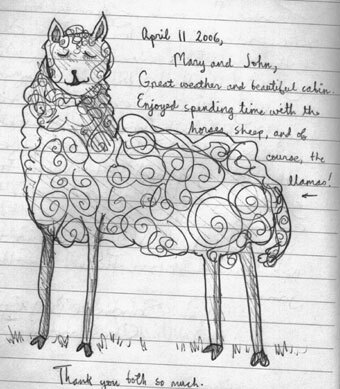 "John and Mary, Thanks so much for the stay at your wonderful cabin. It was definitely one of the best Thanksgiving holidays we've had - and a belated honeymoon as well. We especially enjoyed the loft and the porch. Sarah and Sophie - the border collies - loved the trails! We hope to see you again - Best - PS Sorry, but one of the blackberry bushes ate Sarah's frisbee!" "Very much enjoyed our stay at Cougar Ridge Cottage for the first week of our marriage. Your care and hospitality was very helpful in a time of medical need, and throughout a very strong rainstorm the cottage felt solid as a rock and we felt very secure here. The trails and creek were beautiful, we recommend staying on the trails (no bushwhacking). All in all a wonderful time and we are glad to have been here. Thank you!" "Enjoyed our short visit highlighted by celebrating a 53rd birthday and seeing VTech play Kent State. Thanks!" "Another spectacular visit to Cougar Ridge Cabin! As before, we found our visit relaxing and cozy. The beautiful moon overhead while we enjoyed a campfire was a treat. And sunrise from the loft was stunning!! What a wonderful place to enjoy a family time together!!" "Thank you, thank you - this has been a GREAT week. A wonderful place to start our marriage! So warm and cozy. We were not lacking for anything in this cabin. The sunrise every am from the loft and the majestic scenery all day. Thank you Lord and thank you John and Mary!" "We enjoyed our stay here in your cabin, even though the weather couldn't have been worse. We especially loved the loft, it is so cozy up there and the view is great. The sound of the rain beating on the roof was so soothing at night. It was also nice to sit on the porch and listen to the rain. There is beauty in all things if we look for it." "I stayed here last October with my wife and dogs. We had a great time. This year I'm on my way to Tennessee and spending the night here - beats driving 9 hours or staying in a highway motel. I'm hoping for a great sunrise in the morning. I took the sunrise shot on Mary's website last year, when we stayed here. Tonight I took a picture of the cabin under star trails. Next time I'll be back with the family." "When we arrived late Thursday night in the pouring rain we had no idea how pretty the view was going to be. Thankfully, the rain moved out and we enjoyed beautiful weather for the rest of the weekend. Some of the activities we reveled in while here included: hiking; communing with nature; roasting hot dogs and making s'mores; building big, hot fires in the fire pit; tasting mead - visit your Virginia meaderies! -; seeing Junior Brown at the Floyd Fandango; marveling at the showy fall foliage; petting the horses and llamas; and making merry. Thank you so much for providing such a well-stocked, comfortable cabin. We hope to return soon. This cabin is a wonderful place to stay and we have enjoyed our short time here very much. We are sorry that, due to the weather, we were not able to walk through the woods, or sit outside and listen to the birds, but perhaps there will be another occasion. Also, thank you both for your hospitality. Our family truly enjoyed your cozy, comfyyy cabin. You did a great job! It was an excellent getaway and the blackberry jam was yummmmyyy! "Thank you so much for the use of your beautiful cabin! It was so nice for both of us to get away from school and work for once. We especially loved sitting on the porch at sunset drinking hot chocolate. Your cabin is amazing and we hope to get the chance to come back in the future." "What a neat little slice of natural heaven! Thanks for giving us a last minute respite from Blackberries, laptops and cell phones with our sons. They loved it here. I realized how badly we needed to get back to nature when our 5 yr. old asked "what's that?" and pointed to firewood!! Ah, a sign of the times. The 16 yr. old just got back from the trail - excellent exercise for the ride home! Thanks again ! Love the lack of TV too - didn't even miss it except for them to notice there wasn't one. BTW, Floyd Friday night jams and clogging was a blast for us. A first mother-son dance! Fondly,"
"We found the cabin welcoming and cozy. We hiked most of the trails - some of the parts had challenging climbs which we and the dogs managed to conquer! Enjoyed meeting you both on Sunday. The setting is beautiful with the range in the distance. The cabin reminds me of being in a tree house looking out at the vista - thank you for your hospitality and the blackberry jam. Look forward to a return visit. "The perfect place to call home when we travel to visit our son at Virginia Tech! The night sky was incredible and the night sounds were loud in a quiet and peaceful way. The Milky Way and shooting stars were a stellar treat!! The fleeting sunrise was worth the early rise although the 3 teenagers didn't seem to appreciate it as much as we "old folks". We look forward to our return in November. Thanks for the simple and yet elegant accommodations - just PERFECT!! "Thank you for having your cabin available for one night! Although my stay is too brief; I've enjoyed the cabin and the setting; everything is well done! I don't believe you've overlooked one detail...although a package of coffee would have been great!... I just thumbed through your photo album of the cabin being built - that's great! I liked the pictures of the individuals; it is almost like an Andrew Wyeth book of the birth of a cabin! The absence of a phone, TV, and air-conditioning makes you appreciate open windows, crickets, silence, stillness, and nature. I guess "less is more!" Thank you for the stained glass in the top windows, the sturdy railing, the books, the porch, the morning view...and just a very unique place. PS I found the coffee beans, the grinder,...I think this morning I'll take it black! PS#2 You must be from South Wheaton, IL. You've got Southern Hospitality and make great Blackberry Preserves!" "Your beautiful cabin is a perfect respite from life. Perfectly located on the way to Davidson and Roanoke colleges - we'll be back on our trek south to visit our sons." August 2006 - Movie Night! "Thanks again for a great weekend and family reunion! Great movie, great food, great company - and of course - a great cabin. We enjoyed staying here." "A special trip to a special place. Delightful, soothing, restful...renewing! All that and a music festival too!" We've been dreaming of returning to Cougar Ridge Cottage for one year now, and - of course - we were not disappointed! This mountain haven has become a very special place for us to celebrate our wedding anniversary and to RELAX! I'm writing this note while sitting on the porch here and listening to the birds sing. With that in mind, and being an avid birder, I thought I would record a bird list below of the the most interesting birds we observed while here (others can look for them in the summer season!). "Thank you so much for sharing your family's labor of love with us. We had a wonderfully relaxing weekend. From the warm wood tones and ambient lighting to the scent of the soap, it's obvious you've thought of every detail to provide a peaceful visit. We really enjoyed being tucked away with only nature surrounding us. Our dog, Lucky, enjoyed exploring the trails with us, and had such a deep sleep that night. Thanks for letting us bring him! In our nearly fifteen years together, we have been very blessed to be able to visit a lot of the beautiful places our country has to offer. This cabin tops our list. PS The preserves were delicious!" "I haven't slept this well in months. I could get used to all this quiet. Your trails are fabulous; from the hammock by the creek to the view from slippery slope. Never in my life have I seen so many blackberries and daisies! Loved the jam, by the way. This is by far the most beautiful country I have seen in a while - perhaps ever." "I love this cabin. It's pretty. The wood is nice. I toasted marshmallows and had a happy fourth of July." "We're here celebrating a 42nd birthday, attending a wine and music festival and just relaxing. Thanks for a nice experience, a beautiful view, and the solitude we were needing. Love the cabin!" "We've enjoyed every moment up here in your lovely cabin. Each time seems to be more fun. We took advantage of the rainy days by reading and sleeping. (The girls are marathon sleepers!!) The trips to Floyd and the parkway were fantastic (I like that flat-foot dancing!) Thank you for all the things you do to make our visits special." "I've never been to Virginia, but it is absolutely gorgeous out here. We slept a lot, but when we weren't, we hiked. I was so glad to stay here and meet both of you. Thanks for the hospitality." "I had a lot of fun out at the cabin. The trails really are wonderful. Good luck with your new cabin." "Thank you for the best couple days ever. It's been so long since we've seen each other (about 6 years) and this was the way to do it. We hope to do the same next year. Maybe we'll try out the new cabin! But I don't know, this one sure is beautiful. We saw a wild turkey, and your horses are gorgeous. Thank you! "Great vacation away from home in Mass!" "PS The jam is wonderful!" "What luck! Desperate for a getaway for my husband and me (from jobs and four kids); I found your website. We have had a fabulous weekend here! We both forgot what solitude was like. We sat on the porch and listened to the breezes and birds. We hiked the trails full of wild blackberries and blooming rhododendron. We looked at the stars and watched glorious sunrises from our bed in the loft. We had our dinners in front of the fire and breakfast on the porch (with your fabulous blackberry preserves). We appreciate the thought and care that went into this cabin. Everything was perfect! PS We got to watch a baby owl sleeping in a tree." "After reading the many other entries I am hesitant to say how amazingly perfect was our stay here...seems to be a general consensus... but it is an unavoidable conclusion as we truly have shared a perfect and magical 24 hours here. The cabin - the late night fire with wine and cheese - the soft rain pattering on the tin roof that woke us from our early morning slumber - the absolutely delicious blackberry preserves while cuddled on the couch on a rainy, lazy morning. Your cabin was just what the doctor ordered! We shall be back...soon and often." "Thanks for making our getaway so wonderful. We loved the cabin and the beautiful surroundings. We agree with the previous couple totally. It is so easy to get caught up in the daily routine of work and raising two children and taking each other for granted. It is nice to get away by yourselves and to enjoy each others company. We will definitely return in the near future. Also, thanks for the jam." "Thank you for the wonderful getaway! The cabin is beautiful and relaxing. Thanks for all your hard work and letting us enjoy some time off and get to remember why we love each other. Sometimes you forget when you're busy with work and raising two children. This is just what we needed! Thanks again, we will definitely return...maybe with the kids." "Crisp, cool air but no snow this time. We left plenty back home in PA. Thank you again for a relaxing and much needed break. Good luck with your new cabin. We'll be back - "
"We had a wonderful time. We enjoyed spending time on the walking trails. It was a great weekend with just the girls. We will do it again soon...Thanks for everything." "A beautiful snow was icing on the cake. Thank you for the much-needed scenery." "Thanks for making our second stay even more enjoyable than the first! Words can not express now relaxing your cabin is. We'd tell more people about it, but we don't want it to be booked the next time we want to come! :-)(Just kidding!) Thanks again for providing such an incredible getaway!" "Thank you so much for offering this beautiful cabin. This was a much needed and very refreshing weekend! We hope to visit again." "You are blessed to have such a beautiful cabin. Thank you for sharing it with us. You covered all the small details that made our visit comfortable and relaxed. We hope to return. Your preserves were delicious." "Thanks for a little slice of heaven. Great hospitality, great views, great food, great friends! See you soon." "Wow! What a beautiful place you have here! Your cabin is just perfect! The views are breathtaking! A wonderful place to escape from work, the kids, and just busy life. My husband and I have thoroughly enjoyed our 12th anniversary here. We can't wait to come back and also to tell others of your cabin. Our one regret is that we couldn't stay for a longer time! Thank you so much! PS Thanks also for the jam! It was delicious!" "What a perfect way to ring in the new year! Peace and quiet beats crowds any day!! Your cabin is perfect and we hope to have one just like it one day!! Your cabin in the winter is as lovely as the summer. We were warmed by the snugness of your cabin in contrast to the winter beauty of mountain views and late sunrises. Thank you for again providing an escape for thinking, planning and family fun. (You even have puzzles and books.) Our daughter finished one of the 'Cat Who' books from the summer and two others from your cabin library. We loved being here and celebrating the end of the year in such a quiet wonderful place. Best wishes for 2006 and especially your new cabin." "What a wonderful, relaxing weekend to share with my two best friends - my mom and my dog :-). We all had a great time and can't wait to come back and see another season here and just sit on the front porch when it's a little warmer! A happy new year to everyone." "My wife and I and Peanut enjoyed your beautiful spot immensely and we didn't even have time to walk the trails, which I'm sure are wonderful. Even when it was in the teens, the cabin was very cozy." "Once again we had a great weekend. The weather was beautiful and the cabin was so cozy! What a great place." "We enjoyed your beautiful cabin. The fall colors being so vivid was a pleasant surprise. Plan to come back when we have more time to walk the trails, and definitely for some other VT games in the future." "This beautiful cabin is definitely heaven on earth! We haven't been able to get the smiles off our faces since we stepped in the door. We live in Roanoke and my parents are with us who are visiting from Pittsburgh, PA. What a treat this has been for all of us. We are definitely making plans to come back for a week. Thanks so very much for sharing such a beautiful cabin and for the great hospitality." "Thank you so much for allowing us to share your cabin. It was great sitting on the porch, enjoying the quiet while the stress of the week just disappeared. We loved it!" "We really enjoyed your place very much. We hope we will be able to come back again. Very relaxing." "We enjoyed your cabin. It's comfortable and has a beautiful view. Thanks very much." "We're not sure now this place could be any more perfect. We want one of our own just like it!" "John and Mary, We've been looking forward to this weekend since we stayed in the area last fall - the cabin did not fail our expectations. You have a fantastic place, the cabin fits perfectly with the views, trails, fire-pit, rocking chairs and the four bottles of Virginian wine we shared last night - the beds were nice and comfy too! We'll be back. Thanks." "John and Mary, Thanks so much for a wonderful time. The peace and quiet was just what the doctor ordered for a very memorable honeymoon. While the rain was unfortunate, it did add to the romantic aspects with the sounds of it on the roof. We certainly hope to visit again and we will tell our friends about our wonderful experience. "Wow! This weekend was so relaxing! It was really nice being away from TV, internet and other electronics. We also really enjoyed the trails on the property. Thank God we didn't run into a bear, but we did run into a wild turkey! It walked right across the yard when we were playing a game on the porch. It was so fun! Thanks!" "The entry (below) says it all: Wonderful! Inside and out, you've done a terrific job here. We want to take it all home with us so we can have a model for our own place. Thanks for giving us the opportunity to reconnect with what's important." "Thank you so much, your beautiful cabin with its spectacular sunrise, made our thirty-ninth anniversary the very best." "What a relief to finally make it up here last night after a successful wedding celebration! The change of pace was welcomed after such a long wonderful day. The sunrise was beautiful this morning and we enjoyed relaxing on the porch in the breeze listening to birds sing. We took a refreshing stroll to the creek and enjoyed encountering the local fauna. What a nice secluded spot! We hope to return next year to celebrate our one year anniversary. Thanks for the applebutter and for leaving the key out for us. Sorry we showed up so late, we didn't want to miss a minute of our big day! Thanks again!" "A glimpse of the world through God's eyes." "What a wonderful weekend away from chores and responsibilities! Your cabin is darling and so secluded! We had a great bonfire and spent hours reminiscing and story telling. We hope to come again soon." "My sister and I really enjoyed staying here. The cabin is great! Sitting on the porch last night with the full moon was beautiful! We plan to come back again. Thanks for the applebutter. It was really good! Take care and see you again." "You have a beautiful place. We really enjoyed the peaceful, tranquil setting and hope to return next year." "John and Mary, We have very much enjoyed our stay at your cottage. The cottage is very comfortable and charming, and provided for a memorable visit. We particularly enjoyed the quiet. We feel very fortunate to have been here for your 7th anniversary film festival. What a great event! The quality of the sound and picture was great, and the ambiance (under the stars) was special. You are great hosts. Thanks for making this special place available." "Thank you for a wonderful, peaceful place to relax for the weekend! Floyd Co. is gorgeous and the cabin is perfect! Thanks for the jam - can't wait to get home and try it. See you again soon!" "Washington D.C., Topsail, NC, and Floyd Fest with a night here in this beautiful cabin. These rolling Blue Ridge mountains being the grand finale of our grand tour of the East coast. What a beautiful peaceful place. There's a lot of magic here. Glad we could share it." "John and Mary, we so enjoyed the cabin and the peace and quiet of the location. We have been constantly serenaded by the songbirds and crows, and blessed by cool breezes for the past two days. Your cabin is a renewal retreat for those of us who truly need to 'get away' from so many issues in our day-to-day lives. "Very peaceful! We saw some shooting stars and the Milky Way. The bluebirds and hummingbirds were fun to watch. The weather was very hot, however. The fans are truly a blessing! We spent our two days looking at real estate in Floyd Cty. The cabin is inspiring and clean. Thanks for providing such a haven. We'll be back soon." "Beautiful irenic setting. Loved the trails and blackberry picking. Gorgeous view and adorable cabin (loved the loft)." "We have never seen such beauty before! Traveling by motorcycle was wonderful! The cabin is perfect for relaxing. I wish we could have stayed longer!! Thanks for everything! PS Thank you for the applebutter and preserves, they were outstanding!" "What a gorgeous cabin. You can be justifiably proud of your sons. Since we come to Floyd regularly to see granddaughter, we plan to return. We also have 2 grandsons in NC. We are originally from CT, but have lived in Chester, VA over 30 years. Thanks"
"It has been a dream come true to return to our honeymoon cabin and celebrate our 1 year wedding anniversary. Everything was just as beautiful and peaceful as we remembered! The sunrises in the morning, the gorgeous mountain views, the chorus of songbirds, the coziness of the cabin, and the lack of any distracting city lights are just some of the things that make Cougar Ridge Cottage the perfect mountain retreat. We can't wait to return next year!" "Great place to get away and relax. Was able to get away from Charlotte for a few days and this was great. The apple butter was delicious. Hope to be back again!!" "For true seclusion - this is the place to be! Thanks for everything - Loved the llamas! The sunrise is incredible." "What a beautiful spot. Sitting around the fire our primal selves emerged--I became "man with stick" and Ziggy, "wolf-dog"! My wife looked at us as though we had lost it. Ah well - fires are for men and dogs. Thanks for sharing this great spot." Paul - 'Man with stick', Ziggy - 'wolf-dog' and Michelle - "What's wrong with you?" "What an incredibly beautiful spot. Cabin was perfect. An amazing place to escape to, to recuperate and just to be! Thank u!! "Dear Mary and John, We've had an unforgettable week. Thank you Mary, for being our realtor and hostess. The property you helped us find is just beautiful! Your handling of the offer and purchase has been incredible. After closing in August we need a cabin just like this one. The marvelous hospitality that you've extended has made us feel so relaxed and revived. We look forward to many return visits to Cougar Ridge Cabin as we anticipate a home here in the area. Thanks again! "Great cabin. Great bluegrass music in Floyd. Thanks"
"'Happy 1st Anniversary' and that it is for a 68 & a 70 year special twosome!! Thanks to our Lord and our God for His rich blessings of our lives together with faith for many more years to come. Our honeymoon placed us in a log home in a woods/tree setting with a loft -- so naturally we fell in love with Cougar Ridge Cottage. Very warm and cozy setting and oh those heavy wonderful towels. Thank you for the hospitality, the jam and applebutter, and the opportunity to be your guests." "Wow! What a find! This is a perfect getaway spot for us! We will surely be back and send our friends as well. Thanks so much -- "
"A beautiful place to be. A small side of heaven on earth. Thanks for the hospitality." ." "Your cabin is lovely and views spectacular. We hope we can come back soon for more relaxation." "Thank you for a glorious weekend. The cabin offered a wonderful chance to catch up with old friends. I can't imagine a better place to have done so. "Perfect for a warm fire on a chilly spring night! View is spectacular. Will be back!" "We arrived here late at night and hit the hay. The sunrise we saw from the loft on our first morning here took our breath away. That wasn't the only thing that took our breath...the hiking trails were good at that, too! A toasty fire in the woodstove whilst the rain hit the roof was delightful. You should hear our old dog snoring in his bed...zzzzzzzzz... We hope to be back very soon!" "We thought it only snows in PA in March! You've created an awesome retreat for those of us lucky enough to find it. We had a wonderful evening and plan on making it a tradition. Thank you for your hospitality." L: Wow A, your're amazing you can lite a log with chemicals on it and make it burn! Isn't she wonderful guys? S: Of course! Haven't you known that forever? A: Yeah, all you chicks, can ya dig it?! L: Ok yeah, you know I can dig it, way more than the rest of youz guyz! S: Too bad L! How can you dig it and not pick up a shovel? B: She rides the small bus. See ya later. Bye and thanks. L: Yeah, we had lots of fun and the cabin is great! It was fun :-) A, L, S, B, and S"
"Thanks for a needed reprieve from our normally hectic lives. We walked until our legs could take no more and then relaxed in your beautiful cabin. Hopefully we can get back when the hillside of rhododendron is in bloom. You've done a wonderful job with this place!" "After two tragic days - I was so very lucky to call and you have this cabin free! My dog Josie and I walked every trail and visited all the animals on the property. Thank you so much for a beautiful, quiet, peaceful and romantic spot. We will be back." "An overnight in this beautiful cabin is a treat beyond compare! There is snow on the ground outside, but inside it is warm and toasty. What a quiet and romantic spot." "What a cozy, quiet retreat! A warm fire on a cold evening was just the thing to rejuvenate our spirits. We'll come back as often as we can!" "Thanks sooo much for this wonderful place. My husband thought this was the best present for our tenth anniversary. The highlights were watching the sunset, sitting on the porch rocking, sitting in front of the wood stove watching the flames in the peace and quiet. Of course, we can't forget lying in bed watching those beautiful mountains and sky as the sun was rising every morning. We also did a little sight-seeing; I think the most enjoyable part of that was the Friday night jamboree at the old country store. It was a first for me but I would love to go back. We can't wait to come back and enjoy your cabin again." A wonderful "home" to spend Christmas.Five Star! Looking forward to seeing all four seasons here! Thanks so much from those of us who have had the pleasure of solitude within these cabin walls. The views were spectacular this morning. A great start to a sunny winter day - after a comfortable night of serene thoughts and wonderful conversation. It's the first time I've every seen "Indiana Jones". Thanks for the memories! 'We ain't leaving!' "
Cabin was very great, cozy, peaceful and very comfortable. Being from the Chicago area, this was so peaceful - we truly enjoyed our stay." "Thank you - thank you - thank you! What a lovely cabin and peaceful place. We enjoyed every second of our stay here. My husband, being a brickmason, enjoyed looking at the pictures of your cabin being built and appreciated the hard work and thought that went into it. I enjoyed the "quiet", as we live near an airport and the peace and quiet is a great change. We wish you much success and happiness as you continue to bring such joy to the lives of others :-)"
"After staying here for three exquisite days and nights, I am reminded that we never were forbidden the garden of paradise, were we? Here is all that we yearn for, all that we were born to experience. Thank you for reminding us what life really is all about. We will return." "Great weekend - again. Except...the Hokies lost - again. Thanks for everything." "We came here needing to share a challenging life event with dear friends whom we only see once a year. In this beautiful cabin and these strong mountains, our friends lovingly nurtured us back to wholeness, and the world is feeling safer as we prepare to leave. We're all planning to come back. Thank you for providing the space for all this to occur." "...And we, those friends, found this a wonderful, serene setting to be together." "You have a wonderful cabin and it felt like home for the last few days. We hiked the trails and visited with your animals. We made a couple of fires and enjoyed a few sunrises. Thank you for letting us be a part of your wonderful home. We will be back, of course, and we will make sure to tell our friends about the cabin." "My expectations were met as we drove up to the cabin and walked inside. We stayed here 3 nights as a place to call 'home' while searching for a possible 2nd home near the Parkway. 'Home' was great - quiet, refreshing and comfortable. We cooked meals each evening and enjoyed the apple butter and jam for breakfasts. As everyone previous said, the sunrises were worth about 30 pictures total. The foggy drive to Mabry Mill on Saturday morning was exciting on the twisting back roads. We saw several great homes and home sites and go home to S.C. to plan building a log home up near the Blue Ridge Parkway. The Cougar Loop Trail was challenging in climbing back up the hill to the cabin. But, the trail was very quiet and easy to walk. Nights on the back porch are the best. Thanks for building such a great home and sharing it with us. The balcony bannister design might show up in our log cabin too." "The sounds of nature, a zillion stars and a glorious sunrise! What more could you ask? This is a beautiful place to rest and restore. Thanks for the preserves and apple butter. We enjoyed our stay." "We very much enjoyed our stay in this peaceful and beautiful corner you have created. We appreciated the thoughtfulness you put into this retreat, from the refreshing views down to the lovely decor. A great place for us to celebrate a birthday this weekend!! Thanks again!" "What a wonderful place you both have! I dream of having a cabin as beautiful and cozy as yours. Probably the most comfortable place I've stayed away from home. Can't wait to come back! Thanx so much for everything! :-)"
"What a wonderful weekend! I don't know which I enjoyed more, the cabin or the film festival. It was a very special event to see a theater quality film surrounded by friends and under a beautifully star-filled night. I hope you continue to run films so I can come back again. Thank you for making me feel so welcome. In fact, you have made me feel like I'm part of the family. Staying in the cabin was better than I had dreamed. It's such a cozy space. I felt right at home. My favorite experience was waking up to the sunrise in the loft. I've never been able to watch a sunrise from the comfort of my bed - and then roll over and go back to sleep in the peace and quiet of the country. I look forward to visiting again. Thank you." "We loved the cabin, the serenity, the scenery and the comfort! Our stay is one that we will never forget. Thanks"
"A truly great cabin. The serenity is priceless. It's so nice to return to the basics with comfortable furnishings. The bobcat trail was a 'killer' for an unconditioned body but the walk was fun also. The four of us enjoyed catching up with conversation instead of all the technological interruptions. We will be back many times!! Thank you for providing us a wonderful memory. Wishing you abundant success. PS This was my birthday present 347 :-)"
"On July 10th, we experienced a perfect wedding day. Then... we arrived that evening to your fabulous and welcoming cabin. It was the ultimate way to top off our day! We truly felt at home while we were here and appreciated the thought and design that were put into the details of this building - like the four windows set high on the wall so that you can see the sunrise over the mountains in the morning without stepping a foot out of bed ... You have built a sanctuary here in the Blue Ridge, and we hope to see you again and again over the years when we return to cherish more moments like we had this weekend! PPS We were wondering if we needed to pay extra for the birds serenading us the entire time we were here??!! "The cabin is great - we'd love to take it home with us! Enjoyed it Bunches!!" "Thank you for letting us enjoy this 4th of July weekend in this beautiful cabin. It was very relaxing. We had fun walking the trails and sitting around a fire at night. The view of the mountains is breathtaking. I don't think any of us will forget our stay here. It was really enjoyable." It was a real treat staying here for Memorial Day weekend. We felt very lucky to be staying in a place of such beauty and tranquility. Your wonderful jam and apple butter were certainly highlights, giving us the fuel we needed for the trails through the woods. We hope you'll keep this place just as it is - perfect. "Mary and John, What else can we say but thank you so very much for allowing us to share your cabin & hospitality. The views are certainly reminders of the beauty of this wonderful state of Virginia and our great country. We have so much to be thankful for and this weekend has allowed us the peace and joy to reflect on all our blessings. We will all look forward to returning to this little piece of paradise you and your family have created. "Mary and John, Thank you for a very relaxing week here in the mountains. The cabin is quite something and in a lovely quiet setting. John, your bread was delicious and thank you for the videos which kept Nicholas (2+1/2) amused when the weather was not so good. We all had a wonderful night 'round the campfire, looking at the moon and stars and toasting marshmallows! The walks around your land were great for Nicholas just before his bedtime. We shall leave here with many pleasant memories and thank you both for your hospitality." "Mary and John, Wow! Just what we needed! Your cabin is so beautiful. Your and your boys have created a warm, cozy getaway - a real labor of love. We look forward to bringing our own two boys here. They would love it. The views and surrounding nature are breathtaking - and the wild turkeys, too! Thanks so much for allowing us to visit. We can't wait to return. PS Thanks also for the jam and apple butter. What wonderful reminders of this little paradise for us to take home!" "Thank you so much for sharing this lovely cabin with us. Getting away from Northern Virginia, the computers, the phones, and the TV made this weekend so relaxing. Holly enjoyed walking the trails and was excited to see the horse, cows, llamas and sheep. The blackberry preserves were wonderful, but we're saving the apple butter 'til we get home. It was a beautiful sight waking up to the sunshine poking over the mountains. Thanks again for helping make our getaway unforgettable!" "Thanks for building and making it possible to enjoy your wonderful cabin. Your apple butter and jam made this visit feel like home. The bedroom view with the beautiful sunshine was breathtaking. Never been more relaxed, sitting on your deck in the rocking chairs and enjoying nature and the magnificent Blue Ridge Mtns. Stomping - Flat Footing at Floyd's Country Store was the best entertainment we have had in a long time. Can't wait until we can visit again." "Thank you so much for sharing your beautiful cabin with us. We both enjoyed a relaxing weekend - it was the perfect retreat to reconnect after four years of raising twin girls with no real break! We're revitalized and eager to share your cabin with our daughters next time! Loved the story of how it was built - it's absolutely gorgeous and the sunrise behind the mountain range spectacular. We look forward to another visit soon." "Thank you for a very special weekend! We came here to get away from work and celebrate the one-year anniversary of our first date. Saturday night - in front of a beautiful fire, with Public Radio's Prairie Home Companion in the background - we got engaged. We can't think of a more beautiful and perfect setting for such a happy and exciting weekend. Thanks for everything!" "The cabin was a welcome sight after a full days hunt. We spent three days in the woods and fields across Southern Virginia. The weather was perfect and the scenery was even better. We enjoyed rabbit, squirrel and grouse on the grill. The local wine was a nice addition to our savory meals. We were impressed with the craftsmanship and design of the cabin. It is certainly a "sportsman's paradise" as advertised. John and Mary were outstanding hosts. We look forward to a return visit. The fireplace keeps the cabin plenty warm. The sunrises were spectacular!" "Thanks you for letting us stay in your wonderful cabin. The whole visit was quite extravagant from the snow covered trails to the unfinished wood interior. Loved it!" "The best cabin we have ever stayed in! We made the most of the trails and must have explored a lot of your property! Floyd was fun too - great food, and of course we bought a souvenir bottle of wine at Chateau Morrisette. It snowed a little on the last day, which was another highlight for our sons. We're so pleased you advertised on the Internet or we would never have found you. We will definitely be back - soon!" "Just what we needed. The stars, the sunrise, the quiet. The mountains, the birds, the sound of the stream. We enjoy God's creation - thanks for sharing your piece of it. If the Hokies had won - it would have been perfect." "Thank you very much for providing such a special place to relax. This cabin is truly wonderful, with it's quiet surroundings and beautiful views. We were lucky enough to enjoy a lunar eclipse on Saturday night! Something that we enjoyed so much more without the light pollution. Great place you have here! Thanks again." "Thank you so much for sharing your cabin with all of us. This was a wonderful weekend - one we won't forget. This place is beautiful. We will definitely be coming back - we loved it. Thank you for being so thoughtful and making us the delicious preserves - you are a doll Mary! Thank you for such an amazing weekend - you helped a lot of our dreams come true - I am truly grateful!" "Thank you so much for sharing your beautiful cabin with us. It was so peaceful getting away from everything. The interior of the cabin is beautiful as well as the scenery. Thank you so much." "Thanks for a romantic getaway. My husband and I very much enjoyed your beautiful cabin. The view was breathtaking with the sunrise coming over the mountains. It was a very peaceful and getting back to nature weekend. We really enjoyed for antique shopping. My husband plays the banjo so the Floyd country Store bluegrass music was a real treat for him. Your cabin made a perfect background for photos with our 1953 Chevy pickup. We plan to return again one day." "Thanks so much for allowing us to stay in your beautiful cabin. We loved everything about it. It was so peaceful and quiet, we hated to leave. We hope to return someday soon and once again enjoy the peace and serenity we found here. Thanks again. Thanks for sharing your wonderful cabin. It was so quiet and peaceful. Nothing can compare to the wonderful view. Plan to return soon." "Thanks to technology and communications we were able to get away from it all here. The milkyway at night and the mountains rising out of the fog in the morning, WOW!" "The ultimate in hospitality and peaceful living - Love it here!" "Thank you for a very quiet and peaceful setting for your cozy cabin. We thoroughly enjoyed our stay!" " What a dream! We had such a peaceful and relaxing time listening to the sounds of nature. The cabin is so beautiful and unique with a breathtaking view of the mountains. Thank you so much for a "perfect" time!!!" "What beautiful country! The cabin is wonderful and cozy. We even had our own lightning show with deafening thunder. Tonight we built a campfire below.... Thank you so much!" "We had the best time at the movie, meeting all the relatives, and playin' music in the hills of old Virginia."